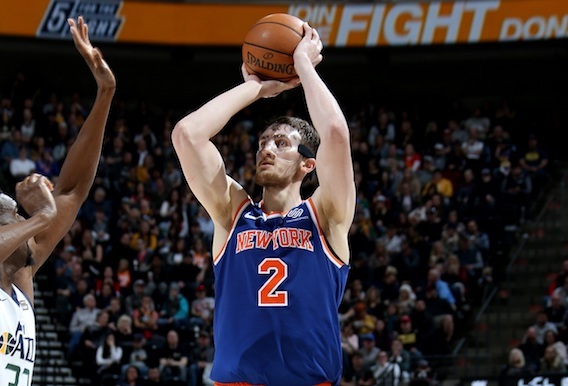 Luke Kornet and Tomas Satoransky preview Thursday’s New York Knicks – Washington Wizards game in London. What are you expecting from the game and the atmosphere from the European fans who are so passionate about the NBA? What do you know about Europe and what kind of attendance you can expect in London? Your father played twice in Italy, what has he been telling you about his experience, the atmosphere here and the basketball culture? Have you been to London before and is there anything in particular you’re looking forward to doing when you come over to London or anything with your teammates in particular? You’re a rookie this season, how is playing in a regular team helping your growth? Are all these losses helping the growth of the team or is this slowing down the process? Do you feel as a young player that playing for a particular franchise, in the world’s most famous arena – The Knicks – 45 years without the title, do you feel some extra pressure from the eyes of the world around you. Do you feel it’s a little different than playing for the other franchises? You’ve faced the Wizards twice already this season, from your perspective who do you see as their key players next Thursday and what do you have to do to stop them from completing the job and getting a third win, in London? Being one of the best players in your university, unfortunately you were not drafted in 2017. Before you played in the summer league, was there an option for you playing in Europe this season? How special is it for you to play in London with the Wizards, having come from the Czech Republic and having your relatives come to the game? What is your emotion of playing in Europe with your NBA team? The Wizards had a lot of injuries during this season, how are you as a team taking all these injuries? Are you still confident you can get back to a playoff place? How is the atmosphere in the team? You’ve faced the Knicks a couple of times this season already and won both of those match-ups. The Knicks narrowly beat you in pre-season, do you think the two games this season give you the edge mentally in the London game or do you think the atmosphere being more mixed might even things up a little bit? What are your expectations for the London crowd and atmosphere at the O2? The crowd will probably be half Knicks fans and half Wizards fans so will probably be a different atmosphere compared to what you’re used to. Have you spoken to anybody in London before? This is your third season in the NBA but is there one thing you miss most about European basketball? And what is the best thing about NBA compared to Europe? The Wizards recently lost John Wall – how the team changed without him and how your role specifically has changed without him of the team? Your first NBA game was against the Bulls, you got 35 points and you got the chance because players were out and it’s frequent in the NBA for that to happen. So what is the difference in opportunity between the NBA and the Euro-League? Is there a difference in Europe as far as young players today maybe get to stay on the court and show off their skills more than in the NBA? What is your opinion on your opponents for the London game? You have ex-teammates such as Mario Hezonja and Kristaps Porziņģis – are you looking forward to playing them more than other teams? How do you improve your self-confidence in the last few games in shooting because you have more opportunities to shoot and more confidence from the coach? How do you improve yourself in these skills? You seem to have a great chemistry with your center Thomas Bryant who is the unexpected rising star for the Wizards this season and your connection with him seems a little bit like your connection with Jan Vesely, another Wizards draft pick. How do you like Thomas on the field and do you think you have something similar like with Jan Vesely?